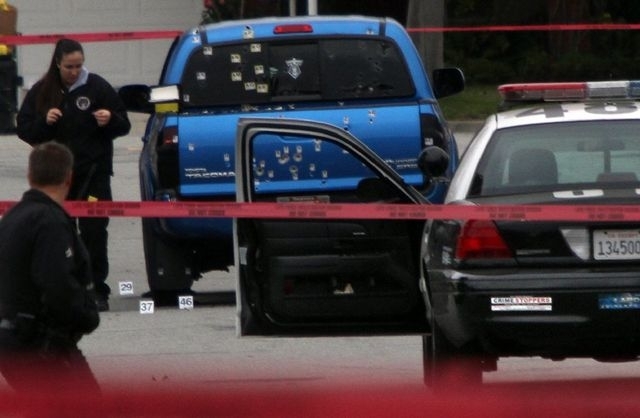 Above: Cowardly LAPD officers opened up on this slowly moving blue Tacoma, apparently attempting a street execution of then fugitive, 270 pound Christopher Dorner. Inside the then slowly-moving truck (of the wrong color and model) were two slight Latina women, 71 year old Emma Hernandez and her daughter, Margie Carranza, 47. The ladies were delivering newspapers, copies of the Los Angeles Times. Mom, Emma Hernandez, was shot twice in the back. Knee-jerk, emotional actions aren't always a good thing, to put it mildly. The CATO Institute does a variety of extremely good work, on broad scope of important issues. I've mentioned the good folks at CATO before, and here I'd like to single out a recent article by Trevor Burrus. The entire text can be found at http://www.cato.org/publications/commentary/assessing-new-gun-control-proposals and I'd like to urge you to read it in its entirety. "A serious debate about gun violence in this country should not focus on mass shootings, which are a tiny, albeit horrific, part of gun violence. Many commentators bring up Americas culture of violence while ignoring government policies that help create that culture. First and foremost is a failed but perpetual drug war that turns nonviolent people into criminals and helps create a network of black markets where violence is necessary part of doing business. Those black markets are also conduits for illegal weapons. Approximately 20% of guns used in crimes come from these markets. Second, we must address a failed public school system, particularly in inner cities, that helps perpetuate poverty and crime. Nearly 66 percent of African-American males who drop out of high school will spend at least a year in prison. Schools must be adaptive to these situations rather than locked in to a failed model because of bureaucratic and political inertia. School choice is the only viable option for fixing those problems. We must pursue well considered laws if we want to lessen Americas gun violence. However, the desire to just do something in the wake of a tragedy like Newtown must be tempered by a realistic assessment of the efficacy and constitutionality of the proposals." Far from a call to do nothing, we should do something. Gun violence in the United States has dropped tremendously since 1992, a steep and stunning decline at over 50%. If we want to progress, if we want to improve, we really need to get our facts straight, for crime is a very heavily studied arena. We know that many of the highest crime rate cities in the United States also have the tightest gun laws. For example, we have Baltimore, Maryland: called a "high-intensity" drug trafficking area by the Department of Justice, Baltimore has seen an increase in gang-related activity over the past several years. The city recorded 196 murders in 2011 -- the fifth highest murder rate in the nation -- and roughly 70% of the victims were involved in the drug trade, according to the Baltimore Police Department. We have Newark, New Jersey: With a violent crime rate up by more than 11% in 2011 compared with 2010. This includes robberies up 23% with a robbery rate ranked third highest of U.S. cities. We have Oakland, California: Homicides jumped 15% to 104 in 2011. Oakland leads all large cities in robbery with 851 robberies per 100,000 residents. Oakland has a noted gang violence problem. We have the seemingly perpetual murder centers of Washington, D.C. and Chicago, Illinois. When it comes to bombastically restrictive gun control laws, California, New Jersey, and Maryland are some of the state leaders in gun laws. Obviously, without the desired effect on criminals. Washington, D.C. and Chicago, Illinois have previously completely banned handguns and still persist with draconian gun laws that only non-criminals seem to follow. These examples along should show even the most ardent of the gun-grabbing zealots that just manufacturing more laws are no guarantee of safer cities: the converse is all too often true. Like a train wreck, we just can't look away from the most heinous of acts. We are glued to them, we have morbid fixation. This is even though of the approximately 13,000 deaths due to violence in 2011, a scant 343 were due to any and all rifles, including the political term of assault weapons. It is very difficult for our nation to claim the moral high ground of all human life is sacred. We have 65,000 freshly dead Syrians where our national solution is to largely spectate. We have great difficulty utilizing the directive of the serenity prayer . . . the serenity to accept the things I cannot change; courage to change the things I can; and wisdom to know the difference. The wisdom part largely eludes us, for complex problems are not solved by easy or simplistic answers, no matter how well-meaning those answers might be. Simply doing something that is well-meaning hardly makes it wise, much less effective, much less well-reasoned. The waste of effort about such items as rifles inclusive of assault rifles and magazine bans is just that: an avalanche of misspent time, money, and debate. Rifles are such a proportionally small part of the picture in the first place and neither the many millions of semi-automatic rifles much less the tens of millions of standard capacity magazines in circulation are in any way controllable. From the myopic view of Washington, things are not what they appear. In rural areas, semi-automatic rifles may well be the only reasonable tools to protect yourself and your property from human and animal predators. It cannot be considered unreasonable for a farmer or rancher to protect his livestock and equipment from predation and theft. Additionally, consider the narcotics trade that is quite well-armed and runs across the 1933 miles of Mexico / U.S. border. 1241 of those border miles touch Texas, with Arizona second at 373 miles. The landscape and situation is far different than Mayberry. Contrary to what some people seem to think, according to United States Bureau of Justice Statistics figures, the rate of violent crime victimization in the United States declined by more than two thirds between the years 1994 and 2009. At about 16.9 victimizations per 1000 persons, the U.S. has roughly half the violent crime rate of Great Britain. Certainly there is more gun crime in the U.S., but our British friends do far more than just compensate for it by other means: they have practically doubled it. So it goes with terrain, population density, population age, and countless other factors. The second largest city in Illinois is Aurora, only about forty miles west of Chicago. Aurora, Illinois has everything that Mayor Rahm Emanuel of Chicago and some Washington politicians want to strip away from law-abiding citizens. Yet, the city of Aurora has managed to curb their homicide rate through a mix of efforts from community groups, schools, and local law enforcement including massive sweeps on gang members and drug dealers. In 2012, Aurora, Illinois had exactly zero homicides. Assault rifle bans, magazine bans, theoretical universal background checks, or closing mysterious loopholes had nothing to do with it. Things like community involvement, neighborhood watch, partnering schools with law enforcement, citizen awareness . . . all of these things take time and group effort. Though lacking the zest of yet another feel-good law, the results are often far more substantial and long-lasting. It also requires no intentional disregard or disrespect of the Constitution of the United States of America, either. There are reasonable approaches to violence control, which is exactly the point, or should be. They require more effort than just making pieces of paper, more thought than spastic knee-jerking, and comprehension that extends well beyond a meaningless fascination with plastic box magazines.